Carla Perlo, founding director of Dance Place in Washington, D.C., doesn’t mince words when describing one of the organization’s main goals: “What’s important to us is inclusivity. We want everyone to feel welcome; it’s in the doing of it that’s difficult. Dealing with that diversity is tough, marketing that diversity is challenging, dealing with the diversity of audience members is oftentimes difficult. Each culture has a different way of functioning, perspective, and set of expectations, and you have to make everyone feel comfortable.” This search for inclusivity and creating a welcoming arts environment is examined through a look at three arts organizations, in part using lessons learned from a recent Wallace Foundation case study of the Southeast Philadelphia-based Fleisher Art Memorial. The Fleisher report is one of ten Wallace case studies intended to be deep dives into organizations that are “reach[ing] new audiences and deepen[ing] relationships with their existing audiences.” One of particular importance to any arts organization with a physical facility, particularly in an urban environment, focused on the Fleisher Art Memorial. Written by Bob Harlow, Staying Relevant In a Changing Neighborhood: How Fleisher Art Memorial Is Adapting to Shifting Community Demographics details the struggle of one arts organization to remain responsive to its surrounding community as the neighborhood demographics have shifted. Fleisher Art Memorial was created in 1898 by Philadelphia industrialist Samuel Fleisher to provide free arts education classes to the surrounding neighborhood. As the neighborhood changed over the decades with waves of Latin American, Southeast Asian, and Chinese immigrants arriving, the demographics of who was using Fleisher’s on-site programming remained virtually unchanged. Just half a mile south of Fleisher Art Memorial is the home of Kun-Yang Lin’s dance company, CHI Movement Arts Center, or CHI MAC. The company rehearses at CHI MAC, and the building schedule is full of classes and other programmatic activities that its neighbors attend. Artistic Director Lin and Executive Director Ken Metzner bought the building in 2007 and live just a few blocks away, and many of the company members also live nearby in the surrounding area. Dance Place is located in the Brookland neighborhood in Northeast Washington, D.C., bordering nearby Edgewood. The area has experienced an immense transformation in the past several years, with large housing developments going up around the subway station and new restaurants and other businesses moving into the largely residential area, which includes Catholic University, as well. 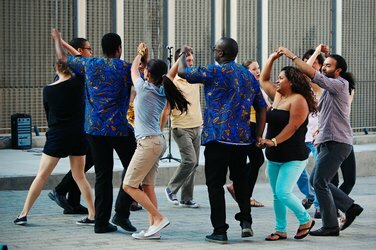 The amount of change has been so rapid that Dance Place recently spearheaded the creation of an arts and entertainment map of the neighborhood to be distributed at the subway stop; the area looks so different and has changed so rapidly that both new visitors and returning ones find the map helpful. Both Dance Place and Kun-Yang Lin were attracted to the diversity present in their respective neighborhoods when they bought their buildings, and view the surrounding mix as an asset. Perlo explains, “We like that it’s always going to be a very economically mixed area. There are two very large buildings [including the Brookland Artspace Lofts, part of the Dance Place campus] that are dedicated to low-cost housing and other buildings in our neighborhood have a certain percentage dedicated to low-cost housing.” The Artspace Lofts are one of the few places in D.C. dedicated to artist housing. Perlo also highlights the importance of reciprocity, and the importance of being mindful when building the organization in coordination with those who take part in the programming. “We built the programs for the neighborhood children, and they helped build Dance Place. 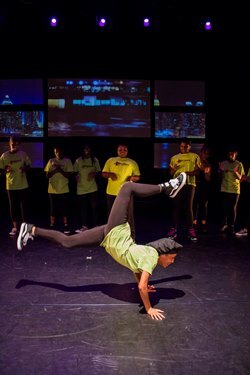 It’s not the adults doing it for the children, we’re doing it together.” This sense of community collaboration permeates the organization at every level, from the youth-maintained garden outside to the large intern program for college dance and arts students. The Fleisher case study points out the importance of participation in civil society networks or associations. The Southeast Philadelphia Collaborative (SEPC), founded in 1999, is a network for after-school activity providers in the area that Fleisher had participated in, laying the groundwork for several important partnerships. Fleisher Director of Programs Magda Martinez described the organization’s investment in the network as “a bank with trust and goodwill in capital.” When Fleisher started conducting focus groups about perceptions in the neighborhood, these relationships meant they had a natural place to start. Similarly, Artistic Director Kun-Yang Lin and Executive Director Kenneth Metzner visited their neighborhood association, the Passyunk Square Civic Association, to introduce themselves and talk about their vision for their facility before they applied for a zoning exception. This pro-active approach served them well and helped build personal connections between the new organization and its neighbors. Dance Place moved to its current home in 1986, and has long been active in the area’s Advisory Neighborhood Commission (ANC). The ANC must give approval for any building projects and working with the group has been “crucial” in facilitating introductions to community members and meetings, particularly when the studio-theater underwent an extensive renovation last year. Dance Place has a steering committee in place comprised of ANC representatives, local business leaders, and artists to help develop policies around its planned public arts park, and to deepen and extend existing relationships and dialogue with its neighbors. All three organizations stressed the importance of listening in the process of building an inclusive space, but they also followed up their listening with actions taken in response to what they heard from community members. At the civic association meeting that Lin and Metzner attended, they heard a request for yoga classes, so they were included in the initial educational offerings at the facility. Fleisher received feedback from community members that their registration forms were confusing, so they simplified, adding more images and editing the text for maximum clarity. Partially in response to focus group results that showed that Fleisher’s home facility in a deconsecrated church was perceived as “imposing, intimidating, and ambiguous,” the organization started doing mobile residencies at neighborhood parks, sending out a van equipped with supplies and trained art teachers. When they started planning the dance facility in 2007, Metzner says “there were some neighbors who were concerned about trash, parking, noise. We embraced their questions and concerns; we listened and then were very deliberate about inviting them in.” For example, the InHale performance series is intended to be a platform for Philadelphia emerging choreographers, but also offers South Philadelphia residents a chance to see an evening of live performance for $10. “They can stay in the neighborhood and see different groups in the same night,” notes Lin. Lin and Metzner describe a thorough approach for their community engagement. They added multiple Spanish-language Zumba classes after listening to community members, then also made sure that the teachers for those classes came from the surrounding neighborhood, maximizing the trust and credibility of the class. When people arrive at CHI MAC, they’re greeted by signage in Spanish and English, and there is almost always a multi-lingual staff person on hand, ready to talk to visitors in English, Spanish, or Mandarin. Fleisher decided to add new classes to its offerings slowly and deliberately. This meant that when they added a bilingual Spanish/English drawing class, they did so with an awareness of the reality of non-traditional work schedules, scheduling it for Mondays to make the class as accessible as possible for those in service-industry jobs, which often have Mondays off. One common element across the three organizations is the alignment with community engagement and organizational mission. Lin and Metzner chose the neighborhood they did in part because they were attracted to the blend of older residents and young people, and community members who had been in the area for many generations, and those who were newer to the neighborhood. Ellen Chenoweth is currently the director of development and communications for Pig Iron Theatre Company and writes regularly for Philadelphia-based dance journal thINKingDANCE . She brings a wealth of formal experience to her current work, with several years at the John F. Kennedy Center for the Performing Arts, and several at the Dance Exchange, where she helped to shepherd the organization through its founder transition and spent two years as managing director. Her financial management and budgeting skills were developed while working for an international consulting firm. She holds a bachelor’s degree in history from Rice University and a master's degree in dance from Texas Woman’s University. Ellen is a graduate certificate student at Wesleyan University’s Institute for Curatorial Practice in Performance. First image: Dance Place Art on 8th with DC Casineros. Photo: Chantal Cough-Schulze. 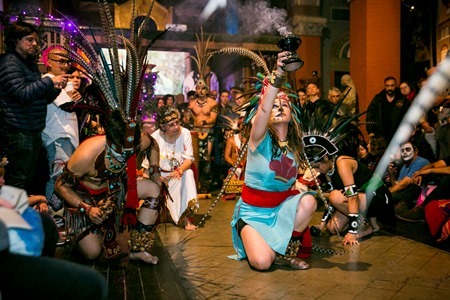 Second image: Dia de Los Muertos celebration at Fleisher Art Memorial with the Aztec dance troupe Cenzontle Cuicatl. Photo: Gustavo Garcia. Third image: Dance Place Energizers Creative Arts Camp Concert. Photo: Jonathan Hsu. Fourth image: Fleisher Art Memorial's ColorWheels van, a mobile art studio. 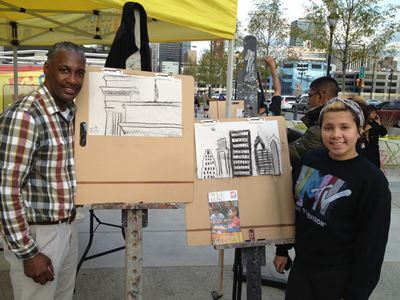 Pictured is an outdoor landscape sketching activity at 30th St. Station- Philadelphia’s Grand Central Station. Commuters and those passing by were invited to stop and sketch their urban landscape. Photo: Fleisher Art Memorial. Be part of the conversation! We welcome and encourage feedback on eJournal articles. You are encouraged to contribute any commentary designed to spark conversation, ask questions, and/or offer constructive criticism. Opinions expressed here do not reflect those of the Dance/USA, its board, staff or members.